"This beautifully-wrought story of Theodore Roosevelt's defense of his claims of corruption in New York State politics has intense echoes today. Abrams and Fisher do a superb job of clearly presenting the issues in this remarkable and intensely dramatic trial." --SCOTT TUROW"This trial and Roosevelt's defense of his reputation on the stand, often under fierce questioning, is truly mesmerizing." --BRIAN KILMEADEThe New York Times bestselling authors of Lincoln's Last Trial take readers inside the courtroom to witness the epic 1915 case in which Theodore Roosevelt, weighing one last presidential run, defended his integrity and challenged the political system. "No more dramatic courtroom scene has ever been enacted," reported the Syracuse Herald on May 22, 1915 as it covered "the greatest libel suit in history," a battle fought between former President Theodore Roosevelt and the leader of the Republican party. Roosevelt, the boisterous and mostly beloved legendary American hero, had accused his former friend and ally, now turned rival, William Barnes of political corruption. The furious Barnes responded by suing Roosevelt for an enormous sum that could have financially devastated him. The spectacle of Roosevelt defending himself in a lawsuit captured the imagination of the nation, and more than fifty newspapers sent reporters to cover the trial. 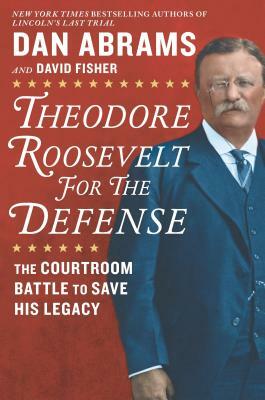 Accounts from inside and outside the courtroom combined with excerpts from the trial transcript give us Roosevelt in his own words and serve as the heart of Theodore Roosevelt for the Defense. This was Roosevelt's final fight to defend his political legacy, and perhaps regain his fading stature. He spent more than a week on the witness stand, revealing hidden secrets of the American political system, and then endured a merciless cross-examination. Witnesses including a young Franklin D. Roosevelt and a host of well-known political leaders were questioned by two of the most brilliant attorneys in the country. Following the case through court transcripts, news reports, and other primary sources, Dan Abrams and David Fisher present a high-definition picture of the American legal system in a nation standing on the precipice of the Great War, with its former president fighting for the ideals he held dear.